Finance Pros, Here's a Guide Written Specifically for You! The Finance Professional's Guide to MBA Admissions Success, an instantly downloadable ebook, shows finance professionals, investment bankers, and PE/VC specialists how to distinguish themselves despite their highly represented profiles. How to use your financial background to your advantage. How to prevent your application from blending into the massive pool of finance applicants. How to target programs that value your financial background and can help you reach your goals. In The Finance Professional's Guide to MBA Admissions Success, Linda Abraham and Cindy Tokumitsu offer professional tips on how finance pros should construct an application strategy, tackle the essays, choose recommenders, and prepare for interviews, all the while proving their unique candidacy, despite their less-than-unique sector. How do they know? Linda has advised literally thousands of successful MBA applicants over the last decade, often from the initial school selection and strategy conceptualization all the way to finalizing the last period of the last essay. Cindy is a senior editor at Accepted who has been helping applicants refine their career goals, articulate their ambitions, and write polished essays and resumes for more than ten years. Linda and Cindy have seen what works and what doesn't. A succinct, 32-tip guide, to successful MBA admissions strategies directed at applicants coming from the crowded finance sector. MBA application insights from a professional with vast admissions experience. A complete set of 2005 Wharton essays with the strategy behind each one. 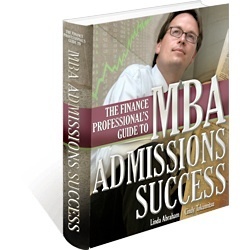 You can purchase The Finance Professional's Guide to MBA Admissions Success for only $34.97. Just click on the “Add to Cart” button below and you will be taken to our simple, convenient order form. Fill it out to receive The Finance Professional's Guide to MBA Admissions Success within minutes.